A clinical perfusionist is a skilled, allied health professional, trained and educated specifically as a member of an open-heart, surgical team. Perfusionists are responsible for the selection, setup, and operation of a mechanical device commonly referred to as the heart-lung machine. Increases in technologies of cardiovascular medicine, such as the use of ventricular assist devices, the total artificial heart, and coronary angiography and angioplasty, have further increased the demand for perfusionists. 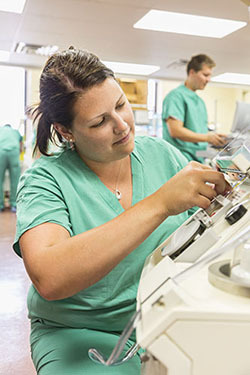 Perfusionists work in hospital settings and most are employed either by hospitals, individual surgeons, surgical groups, or private health care corporations. Experienced perfusionists may find career opportunities working for companies who manufacture perfusion supplies and equipment. These individuals may be employed in research and development, or in some cases, may be employed in marketing or sales. A typical work week consists of a 40-hour schedule with additional on-call coverage for emergencies. Perfusionists may be called to work evenings and weekends. Perfusionists enjoy starting yearly salaries that range from $85,000 to 90,000. In most cases additional compensation in the range of 10-25 percent of base salary may be earned for "on-call time" and shift differentials. The Clinical Perfusion Education Program at UNMC also has a perfusionist Masters Degree Clinical Perfusion (MDCP) Distance Option. This online program is designed for working perfusionists who have completed an accredited perfusion education program in the United States, have a bachelors degree separate from their perfusion training, and would like to earn a Masters of Perfusion Science degree. The masters of perfusion science degree in clinical perfusion is achieved through an Individual Plan of Study that tailors your clinical and educational background to your professional goals. All the required courses are available through distance learning technology. This allows you access to UNMC while continuing to work in your community.